NEW - Version 5.2: Now supports SQL Server 2019! 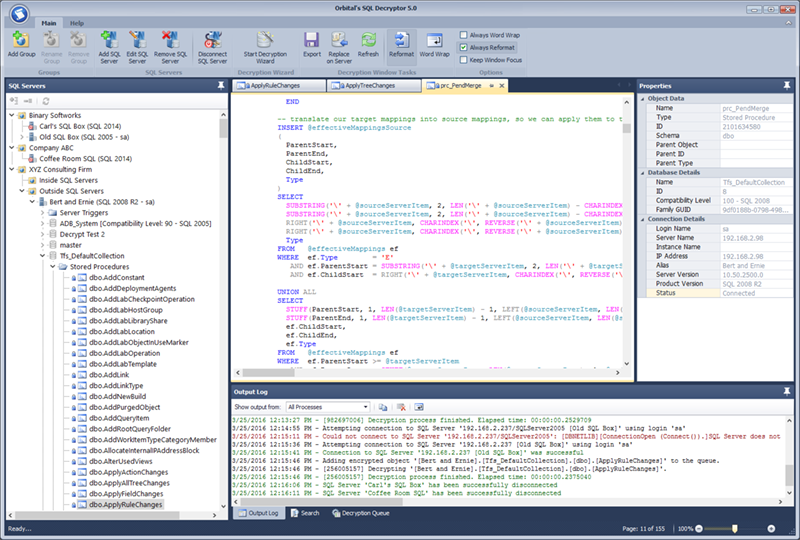 Orbital's SQL Decryptor is a high quality, professional Microsoft SQL Server object decryption tool that works with SQL Server 2005 and later. 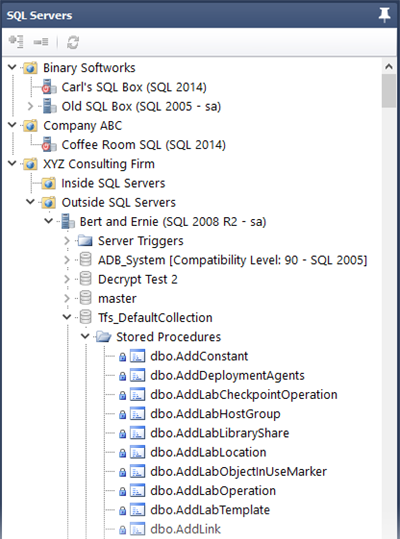 We created the original SQL Server Object Decryptor way back in 1999. And now, with the release of Version 5, we've completely re-written it from the ground up, with a slick interface and jam-packed with a ton of new features. Stored Procedures, Numbered Procedures, User Defined Functions (scalar, inline, multi-statement table-valued), Views, View Triggers, Table Triggers, Logon Triggers, Database Triggers, Server Triggers and encrypted objects that have been re-named. Download our FREE trial and you'll see why it's the preferred SQL Server decryption tool of database administrators and consultants world-wide. * Comparisons were done on dbForge 3.0.8, Optillect 2.0, DMT 3.20, SysTools 2.0 and were deemed the most recent versions at the time of this writing. We offer a non-expiring limited-functionality trial version so you can take your time and evaluate our software to make sure it's right for you. Once you purchase a license you can activate the trial and unlock all the features. Each license costs $49.95 USD with discounted prices available on bulk purchases. A serial number will be issued for each license allowing you to install the decryptor on 2 separate devices. * The Microsoft .NET Framework 4.6 is included in our installer, just in case. It is possible to run Orbital's SQL Decryptor on earlier operating systems but we are unable to guarantee program stability since Microsoft has ended support for them. For more information about Microsoft Windows Life-cycle Support, please click here.